With the popularity of e-books and access to information on the Internet you might think that libraries are becoming an institution of the past. But in fact, libraries, especially in our small, rural communities, are more important and vital to our communities than ever before. 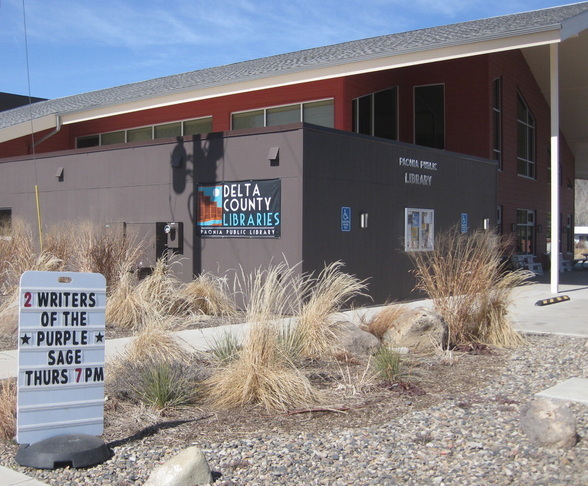 On average, the three libraries in the valley—Crawford, Hotchkiss, and Paonia—serve over 10,000 patrons a month. While the digital age has brought with it new and changing resources and questions, one thing remains the same—libraries are the community centers of communication, learning, and culture. In the past month, I have attended three amazing programs that emphasized this—a presentation by local author Craig Childs about his recent expedition to the largest ice field in the US, a geology talk by Colorado Geological Survey geologist Dave Noe about the geology of the North Fork Valley, and a freemotion fabric collage sewing class with local fiber artist Rain Klepper. This high quality (free!) programming is just a sampling of the life-long learning opportunities that our libraries provide. From baby/tot time and teen game nights to GED and ESL classes and iPad classes for seniors, the libraries offer classes and programs for all ages. The library is also a space for community groups to meet. Book clubs and non-profits, knitters and classical music connoisseurs, yu-gi-oh gamers and Spanish conversationalists all use the library as a place to meet, share ideas, and learn. What excites me most about the library is that it is more than just a space to meet and obtain information: it is a space to create. This past summer, the Paonia Library was able to purchase a new Mac desktop computer and software for musicians and artists with funds from the Broadband Technology Opportunities Program (BTOP), a state grant that utilized federal monies to expand broadband access and adoption in communities throughout the country. Termed the “Creative Station,” this computer attracts many different patrons who use the software for personal and business needs. It has also been attracting students. One group of middle school students meets every Monday afterschool to make and edit movies and music. With a self-appointed director and crew of actors, actresses, and musicians, they write scripts and mix music to create short, usually silly video clips. To me, this is a great example of the way libraries function as centers of learning and culture, inspiring creativity in patrons of all ages. The library services are not just contained in the walls of the library either. Programs like “Armchair Travel” let you explore the world through the adventures of fellow patrons, new Library sponsored wi-fi Hot Spots throughout downtown Paonia are allowing patrons easier access to information, and a traveling bike book cart also lets librarians bring books to popular community festivals. And amongst all this change in technology, access to information, and range of services libraries provide, the constant librarian adapts to it all. Helping patrons with book recommendations, reference questions, and technology help, these friendly staff are always creating programs and learning new skills in order to respond to patrons needs and questions. Photo credits: Barbara K. Richardson, from the Paonia reading on her book tour. 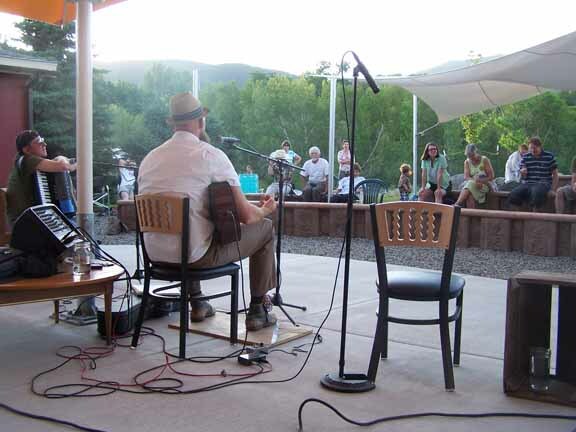 Tom Wills, North Fork Merchant Herald: Russ Chapman entertains during a summer evening concert in the Paonia Library’s community amphitheater. Eligible voters in the Delta County Public Library District have the opportunity to vote their support for Delta County libraries on their mail ballot this year with Delta County Public Library District Question 4A. October 29, 2013 Last day to apply for a mail-in ballot (absentee) if mailed. November 1, 2013 Last day to apply for a mail-in ballot (absentee) if picked up. Drop off hours are 8:30 am to 4:30 pm Monday through Friday and 7:00 am to 7:00 pm on Election Day.